This is a message of manifestation, abundance and prosperity; good luck and fortune. But it is coming directly from YOUR creativity and previous work. YOU have created this, and can be proud of your efforts. YOU made the commitment and stuck it out, putting heart and soul into it. And yes, probably some blood, sweat and tears too! It is time to reap the rewards of your vision, intention, focus, action and conviction. You made this happen. Way to go YOU! Celebrate your victory. Claim your hard earned success; it is imminent if not happening right this very moment. Connect to your creative aspect by working with the colours orange and gold and the spectrum between. All the coppers and bronzes and shades of the sunset are yours now. Wear them, paint with them, create with them or buy yourself some spectacular tulips and enjoy a burst of colour at home. Wear your orange stones too, or place them in your pocket or under your pillow. Carnelian, Amber, Citrine, Strawberry Quartz are all fantastic examples. 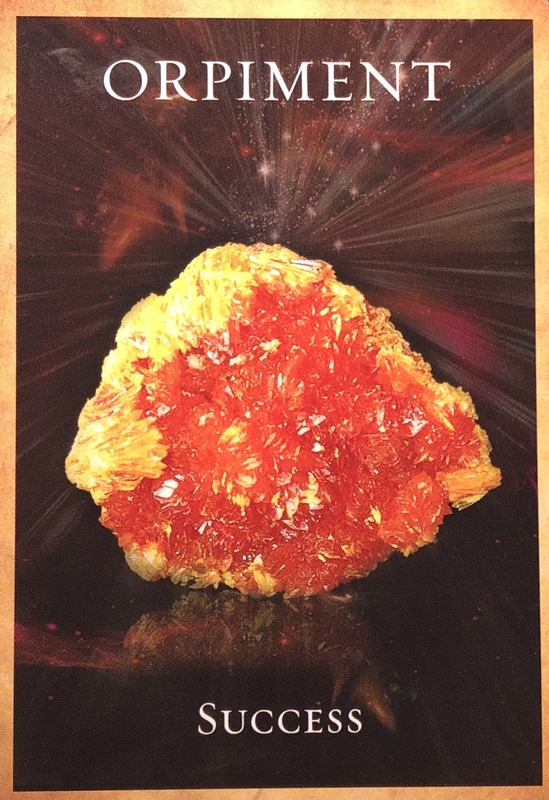 It is fairly unlikely you have Orpiment at home, unless you are a collector of fine mineral specimens, but remember, you can connect to the energies by gazing at the card and intending to do so! Take the opportunities that come your way this weekend, they are stepping stones to something much bigger. Get out and celebrate with friends. Treat yourself to something fun. You deserve it.